It's always interesting to look back and find turning points in my life. Points that really helped pivot my direction. For me, one of those points came in the spring of 1999 in Oregon. I was taking a semester off of school to try and redpoint a big project of mine, To Bolt or Not To Be, in Smith Rock, OR. Smith had quickly become my favorite climbing area over my high school years. It was a seven hour drive from my home, making it my destination of choice for any three day weekend or school vacation. For whatever reason, the climbing at Smith really suited me. I love the technical nature of the climbing, the balancey moves, and the history behind the routes. To Bolt, in particular, always seemed like a fantasy climb. On my first trip to Smith, I remember staring up at the route, seeing chalked spots on the wall that were supposedly "holds." However, they were no more distinguishable than the blank face next to them. One of my climbing heroes, Ron Kauk, had recently done the climb and I just remember thinking "only heroes can climb this climb, not mere mortals like me." Over the course of two years, I made a handful of trips up to Smith, slowly learning the climbing and becoming more familiar and comfortable with the area. I was far from a local, but a few less butterflies occupied my stomach when I started up each climb. 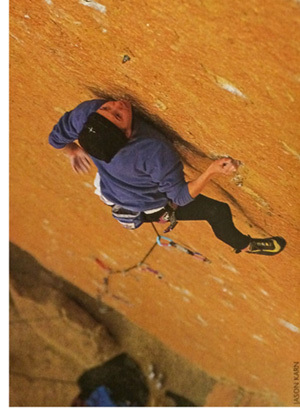 During this time in my life, the primary focus in my climbing was competing and onsight climbing. I rarely tried things more than a few times, often feeling that my first try up something was my best try. After several seasons at Smith I wanted to try something a bit more in depth. I had never projected anything longer than a few days, and thought that the next step in my climbing would be to learn how to redpoint something. I thought the worst thing that could happen is I get to spend time in one of my favorite places and come away with a better understanding on how to work a route. Unfortunately, the best time to try To Bolt was in the fall or the spring. I had just started my first year at college, leaving only summers to go on climbing trips. I vacillated back and forth on what to do and eventually told my parents that I was going to take off a semester of college to try this route. I swore to them that if I could do the climb I would get the climbing bug out of my system and then focus totally on schoolâ€¦..little did I know what was going to happen. I spent a month up at Smith, from mid March to mid April working on To Bolt Or Not to Be. My first day on the route I could hardly do any of the moves. I remember thinking how pointless the month was going to be, I almost gave up to try something easier. I told myself that if I didn't notice any improvements the next day, I would give up. The next day went slightly better. I managed to do a few more moves on the 140 foot climb. I swung back and forth from feeling depressed to encouraged. I could only do 20 or 30 moves out of the entire route. The optimistic side of me was excited by my progress each day, and the pessimistic side was worried at how far I had to go. However, I suppose that's why I was there - to learn how to redpoint a hard route. In the beginning, I was mainly climbing on it with my good friend Brittany Griffith. We set up a top rope and started sussing out short sections of the climb. It was satisfying to try moves that were at my limit and then eventually unlock them. Each day I hoped to see progress, even if it was small. Brittany headed out on some trips, giving me the chance to climb with different partners the rest of the time. Dave Graham came into town, quickly dispatching of most of Smith's hard climbs. It was incredible to see him climb To Bolt in a few days, compared to my several weeks. He didn't even have a sequence completely dialed; his fingers were strong enough to spare him a few extra seconds to figure out a sequence while on the redpoint go. He gave me enough inspiration to make a lot of progress on the route. As he jetted out of town I started working on it with my friend and local hard woman Jeanne Young. I learned patience and a better understanding of projecting a route from Jeanne. She was a seasoned veteran of Smith's techy, involved climbs. She knew how to balance her way from dime edge to dime edge, and taught me how to take my time with the climb. Unfortunately, by mid April, the warm weather was threatening to descend onto the park. One disadvantage to trying the route in the spring was the encroaching weather. Luckily, I had managed to make enough progress on the route and was ready to start to try and redpoint the climb. The route faces east, leaving the best temperatures at the end of the day. Tying in below the climb on my first redpoint attempt brought back all those nervous butterflies that I had on my first trips to Smith. I had spent so much time on this piece of rock, more than any other climb in my career. I had come from being able to do five moves, to every move. An amazing journey. On my first redpoint attempt, I fell at the fifth bolt crux. A part of me was devastated, hoping that I would have just done it that try. However, another part of me knew that it was going to take everything I had to do the route. A few days of redpoint attempts and I was starting to get higher and higher on the climb. The excitement built, and I was hoping that I would be lucky enough to finish the climb before it got too hot to hold onto the micro edges. Unfortunately skin issues sidelined me for a few days. As the temps rose, so did my anxiety that I might not have the opportunity to finish this climb that I had dedicated a month of my life to. However, it was probably a blessing in disguise, forcing me to rest and fully recover for my next attempts. Around that time, the famous Lynn Hill lived very close to Smith Rock. She was hardly ever in town as her profession took her to all corners of the world. I lucked out, and she happened to be home near the end of my trip. I had met Lynn very briefly at trade shows and the X-Games in previous years, but I wasn't sure she even knew my name. The climbing community is very small, and back then it was even smaller. Her climbing partners at Smith were also my climbing partners, allowing us to climb and hang out together. The first few days I climbed with her, I was so nervous I didn't say a proactive word to her. I would politely respond if she asked me a question, but couldn't budge any words out otherwise. I did notice it helped my climbing, making me try harder in the company of one of my idols. After a few days of rest and a lot of neosporin on my skin, I threw myself back at the route, knowing that I only had a few days left on the route before summer's heat set in. Lynn had climbed the route a year earlier, offering informative short person beta. She also offered to take pictures of me on the route as I tried it. I nervously accepted, how could I turn down one of my climbing idols helping me with beta and taking pictures of me? I felt an internal sense of pressure. I also wanted to climb as well as possible in front of Lynn. I had a few good tries the next day, but was still falling at the ninth bolt crux. During my time at Smith, I was fortunate enough to stay in the home of another climbing idol, Jim Karn. He was more than gracious to allow a scrawny teenager stay at his house. In return for a roof over my head, I would bake cookies, crumbles, pies, brownies, and anything else I could find in a cookbook that included sugar and butter. It was nice to have my rest days to bake. I always love the creative outlet of climbing, and now had rest days to be creative in another way - a tasty one! It was a great trade. Jim had transitioned from climbing full time to biking, but would occasionally come out to the crag with me. However, this whole trip to Smith I had yet to convince him to come out. Near the end of April, I finally lured him out. I felt so psyched and fortunate to have both Jim and Lynn there supporting me, but also a incredibly nervous - I couldn't bumble the climb in front of two legends! It was the warmest day yet, and I felt like that my chances were probably slim to none, but I had to try in the present company. I tied in and started up the climb. The holds felt smaller and my skin felt wetter. I had to bear down on the dime edges a little harder. My forearms became pumped at the fifth bolt crux. "Crap." I thought to myself. "This is it, probably my last day on the route and I'm already tired and it's hot." I almost let go because of the pain in my fingers. My skin hurt, I was pumped, and it was hot. I tried just a little harder thinking I should at least have my last try on the route be a valiant one. I surprised myself and made it through the lower crux. I slowly tick-tacked my way up to the ninth bolt crux. I camped out on the full pad edge right before the crux. I tried to calm my nerves. I blew on my finger tips trying to dry them out. I chalked incessantly and furiously, hoping for better friction. I could hear Jim below giving words of encouragement. After a couple of minutes I was as rested as I was going to be and started into the crux. The holds seemed smaller and my skin was still wet, but I crimped hard. I crimped from edge to edge balancing my way through the crux. I tried to remember how Jeanne did it, I tried to channel her grace. After a few moves, my left hand grabbed a good edge. My feet danced their way underneath me, and I was through the crux! My legs started shaking with excitement and fear. I was through the hardest part of the route to my high point. It should be over by now. However, I made a rookie mistake the entire month I was trying the route. I only went to the chains once or twice before, even though it was a solid 30 feet of 5.12 climbing to the top. What the heck was I thinking?! I calmed myself down and tried to remember how I was capable of climbing 5.12. I knew I had the ability, but was unsure if I could do it after climbing my hardest section of rock to date. I took deep breaths and quested upwards. Slowly but surely I made my way by each bolt. As I traversed out to the arete and the chains. The butterflies returned to my stomach and a smile plastered across my face. I couldn't believe I had finally done it. As I clipped the chains, I took a second to remember my first day looking at To Bolt, thinking there was no way that I could ever climb something like it. It was amazing to think how far I had come in those few years as a climber. I then thought to my month here, and how I learned about redpointing a route and the long journey it required. When I got down I gave Jim a hug and Lynn congratulated me. I knew that without them there, I probably wouldn't have tried so hard that day, I probably wouldn't have done it. We packed up our bags and hiked out of the Park, a smile graced my face the entire time. That night we had celebratory pizza at Lynn's house. It was just a handful of us, but I felt like the luckiest person in the world. Friends surrounded me and I had just accomplished a goal I thought impossible. And so began my life and attempt at being a full-time professional climber. I went to Madagascar, a complete gumby, with an all star group. I learned more than I ever thought, more than any classroom could ever teach me. It gave me the courage try at my dream of climbing full time. Thanks mom and dad for understanding and allowing me to keep postponing college. And thanks Lynn for giving a totally newbie the shot at climbing and learning from the best.